Wednesday, August 29 from 11 A.M.- 1 P.M.
- This week, ‘Summer Strawberry’ is venturing to the state that shares Massachusetts’ northern border with Vermont. - This city is about 20 miles north of Lowell, MA and is the second largest city in its state, behind Manchester. Nick-named ‘The Gate City,’ it is home to shopping havens such as Pheasant Lane Mall and Amherst Street. 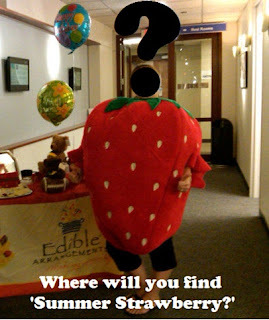 - ‘Summer Strawberry’ will be visiting the Edible Arrangements store located in a large shopping plaza off of Main Street. - This Edible Arrangements is the healthiest one on the block, as it is neighbors with Colonel Sanders’ major fast food chain and a large coffee and donut retailer founded in Quincy, MA.